Definition at line 159 of file llprocessor.h. Definition at line 105 of file llprocessor.cpp. References CPUInfo, strCPUName, and uqwFrequency. Definition at line 631 of file llprocessor.cpp. References ProcessorExtensions::_3DNOW_InstructionExtensions, ProcessorInfo::_Data, ProcessorExtensions::_E3DNOW_InstructionExtensions, ProcessorInfo::_Ext, ProcessorInfo::_Instruction, ProcessorInfo::_L1, ProcessorInfo::_L2, ProcessorExtensions::AA64_AMD64BitArchitecture, ProcessorCache::bPresent, ProcessorTLB::bPresent, CheckBit, CheckCPUIDPresence(), CPUInfo, ProcessorL1Cache::Data, ProcessorExtensions::EMMX_MultimediaExtensions, FALSE, GetStandardProcessorConfiguration(), GetStandardProcessorExtensions(), ProcessorL1Cache::Instruction, ProcessorInfo::MaxSupportedExtendedLevel, ProcessorInfo::strBrandID, strCPUName, ProcessorInfo::strFamily, ProcessorInfo::strModel, ProcessorTLB::strPageSize, ProcessorCache::strSize, TranslateProcessorConfiguration(), ProcessorCache::uiAssociativeWays, ProcessorTLB::uiAssociativeWays, ProcessorTLB::uiEntries, ProcessorInfo::uiFamily, ProcessorCache::uiLineSize, ProcessorInfo::uiModel, ProcessorInfo::uiStepping, and ProcessorInfo::uiType. Definition at line 224 of file llprocessor.cpp. References CheckCPUIDPresence(), CPUInfo, FALSE, GetStandardProcessorConfiguration(), GetStandardProcessorExtensions(), ProcessorInfo::MaxSupportedLevel, ProcessorInfo::strBrandID, strCPUName, ProcessorInfo::strFamily, ProcessorInfo::strModel, ProcessorInfo::strProcessorSerial, TranslateProcessorConfiguration(), ProcessorInfo::uiBrandID, ProcessorInfo::uiExtendedFamily, ProcessorInfo::uiExtendedModel, ProcessorInfo::uiFamily, ProcessorInfo::uiModel, ProcessorInfo::uiStepping, and ProcessorInfo::uiType. Definition at line 1035 of file llprocessor.cpp. References ProcessorInfo::_Data, ProcessorInfo::_Instruction, ProcessorInfo::_L1, ProcessorInfo::_L2, ProcessorInfo::_L3, ProcessorInfo::_Trace, CheckCPUIDPresence(), CPUInfo, ProcessorL1Cache::Data, FALSE, GetStandardProcessorExtensions(), ProcessorL1Cache::Instruction, ProcessorInfo::strBrandID, ProcessorCache::strCache, strCPUName, ProcessorInfo::strFamily, ProcessorInfo::strModel, ProcessorInfo::strProcessorSerial, ProcessorTLB::strTLB, ProcessorInfo::uiBrandID, ProcessorInfo::uiFamily, ProcessorInfo::uiModel, ProcessorInfo::uiStepping, and ProcessorInfo::uiType. 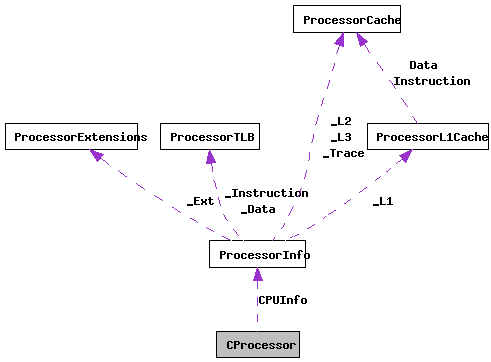 Definition at line 1096 of file llprocessor.cpp. Referenced by AnalyzeAMDProcessor(), AnalyzeIntelProcessor(), AnalyzeUnknownProcessor(), GetCPUFrequency(), GetCPUInfo(), GetStandardProcessorConfiguration(), and GetStandardProcessorExtensions(). Definition at line 2120 of file llprocessor.cpp. References ProcessorExtensions::_3DNOW_InstructionExtensions, ProcessorInfo::_Data, ProcessorExtensions::_E3DNOW_InstructionExtensions, ProcessorInfo::_Ext, ProcessorInfo::_Instruction, ProcessorInfo::_L1, ProcessorInfo::_L2, ProcessorInfo::_L3, ProcessorInfo::_Trace, ProcessorExtensions::AA64_AMD64BitArchitecture, ProcessorExtensions::ACPI_ThermalMonitorAndClockControl, ProcessorExtensions::Altivec_Extensions, ProcessorExtensions::APIC_AdvancedProgrammableInterruptController, ProcessorExtensions::APIC_ID, BOOLADD, ProcessorExtensions::CLFLUSH_InstructionCacheLineSize, ProcessorExtensions::CLFSH_CFLUSH_Instruction, ProcessorExtensions::CMOV_ConditionalMoveAndCompareInstructions, COPYADD, CPUInfo, ProcessorExtensions::CX8_COMPXCHG8B_Instruction, ProcessorL1Cache::Data, ProcessorExtensions::DE_DebuggingExtensions, ProcessorExtensions::DS_DebugStore, ProcessorExtensions::EMMX_MultimediaExtensions, f, ProcessorExtensions::FGPAT_PageAttributeTable, FORMATADD, ProcessorExtensions::FPU_FloatingPointUnit, ProcessorExtensions::FXSR_FastStreamingSIMD_ExtensionsSaveRestore, GetCPUFrequency(), GetCPUInfo(), ProcessorExtensions::HT_HyperThreading, ProcessorExtensions::IA64_Intel64BitArchitecture, ProcessorL1Cache::Instruction, ProcessorInfo::MaxSupportedExtendedLevel, ProcessorInfo::MaxSupportedLevel, ProcessorExtensions::MCA_MachineCheckArchitecture, ProcessorExtensions::MCE_MachineCheckException, ProcessorExtensions::MMX_MultimediaExtensions, ProcessorExtensions::MSR_ModelSpecificRegisters, ProcessorExtensions::MTRR_MemoryTypeRangeRegisters, ProcessorExtensions::PAE_PhysicalAddressExtension, ProcessorExtensions::PGE_PTE_GlobalFlag, ProcessorExtensions::PN_ProcessorSerialNumber, ProcessorExtensions::PSE36_36bitPageSizeExtension, ProcessorExtensions::PSE_PageSizeExtensions, ProcessorExtensions::SEP_FastSystemCall, ProcessorExtensions::SS_SelfSnoop, ProcessorExtensions::SSE2_StreamingSIMD2_Extensions, ProcessorExtensions::SSE_StreamingSIMD_Extensions, ProcessorInfo::strBrandID, ProcessorCache::strCache, ProcessorInfo::strFamily, ProcessorInfo::strModel, ProcessorInfo::strProcessorSerial, ProcessorTLB::strTLB, ProcessorInfo::strType, ProcessorInfo::strVendor, ProcessorExtensions::TM_ThermalMonitor, ProcessorExtensions::TSC_TimeStampCounter, ProcessorInfo::uiExtendedFamily, ProcessorInfo::uiExtendedModel, uqwFrequency, and ProcessorExtensions::VME_Virtual8086ModeEnhancements. Referenced by LLCPUInfo::stream(), and WriteInfoTextFile(). Definition at line 1128 of file llprocessor.cpp. References ProcessorInfo::_Data, ProcessorInfo::_Instruction, ProcessorInfo::_L1, ProcessorInfo::_L2, ProcessorInfo::_L3, ProcessorInfo::_Trace, ProcessorCache::bPresent, ProcessorTLB::bPresent, ProcessorCache::bSectored, CPUInfo, ProcessorL1Cache::Data, ProcessorL1Cache::Instruction, ProcessorTLB::strPageSize, ProcessorCache::strSize, ProcessorCache::uiAssociativeWays, ProcessorTLB::uiAssociativeWays, ProcessorTLB::uiEntries, and ProcessorCache::uiLineSize. Definition at line 116 of file llprocessor.cpp. References CheckCPUIDPresence(), end, start, and uqwFrequency. Referenced by LLFastTimer::countsPerSecond(), CPUInfoToText(), and LLCPUInfo::LLCPUInfo(). Definition at line 1572 of file llprocessor.cpp. References AnalyzeAMDProcessor(), AnalyzeIntelProcessor(), AnalyzeUnknownProcessor(), CheckCPUIDPresence(), CPUInfo, ProcessorInfo::MaxSupportedExtendedLevel, ProcessorInfo::MaxSupportedLevel, NULL, and ProcessorInfo::strVendor. Referenced by CPUInfoToText(), and LLCPUInfo::LLCPUInfo(). Definition at line 1445 of file llprocessor.cpp. References CheckCPUIDPresence(), count, CPUInfo, DecodeProcessorConfiguration(), and ProcessorInfo::MaxSupportedLevel. Referenced by AnalyzeAMDProcessor(), and AnalyzeIntelProcessor(). Definition at line 1512 of file llprocessor.cpp. References ProcessorInfo::_Ext, ProcessorExtensions::ACPI_ThermalMonitorAndClockControl, ProcessorExtensions::Altivec_Extensions, ProcessorExtensions::APIC_AdvancedProgrammableInterruptController, ProcessorExtensions::APIC_ID, CheckBit, CheckCPUIDPresence(), ProcessorExtensions::CLFLUSH_InstructionCacheLineSize, ProcessorExtensions::CLFSH_CFLUSH_Instruction, ProcessorExtensions::CMOV_ConditionalMoveAndCompareInstructions, CPUInfo, ProcessorExtensions::CX8_COMPXCHG8B_Instruction, ProcessorExtensions::DE_DebuggingExtensions, ProcessorExtensions::DS_DebugStore, ProcessorExtensions::FGPAT_PageAttributeTable, ProcessorExtensions::FPU_FloatingPointUnit, ProcessorExtensions::FXSR_FastStreamingSIMD_ExtensionsSaveRestore, ProcessorExtensions::HT_HyperThreading, ProcessorExtensions::HT_HyterThreadingSiblings, ProcessorExtensions::IA64_Intel64BitArchitecture, ProcessorExtensions::MCA_MachineCheckArchitecture, ProcessorExtensions::MCE_MachineCheckException, ProcessorExtensions::MMX_MultimediaExtensions, ProcessorExtensions::MSR_ModelSpecificRegisters, ProcessorExtensions::MTRR_MemoryTypeRangeRegisters, ProcessorExtensions::PAE_PhysicalAddressExtension, ProcessorExtensions::PGE_PTE_GlobalFlag, ProcessorExtensions::PN_ProcessorSerialNumber, ProcessorExtensions::PSE36_36bitPageSizeExtension, ProcessorExtensions::PSE_PageSizeExtensions, ProcessorExtensions::SEP_FastSystemCall, ProcessorExtensions::SS_SelfSnoop, ProcessorExtensions::SSE2_StreamingSIMD2_Extensions, ProcessorExtensions::SSE_StreamingSIMD_Extensions, ProcessorExtensions::TM_ThermalMonitor, ProcessorExtensions::TSC_TimeStampCounter, and ProcessorExtensions::VME_Virtual8086ModeEnhancements. Referenced by AnalyzeAMDProcessor(), AnalyzeIntelProcessor(), and AnalyzeUnknownProcessor(). Definition at line 1427 of file llprocessor.cpp. References ProcessorInfo::_Data, ProcessorInfo::_Instruction, ProcessorInfo::_L1, ProcessorInfo::_L2, ProcessorInfo::_L3, ProcessorInfo::_Trace, CPUInfo, ProcessorL1Cache::Data, ProcessorL1Cache::Instruction, TranslateCache(), and TranslateTLB(). Definition at line 2224 of file llprocessor.cpp. Definition at line 171 of file llprocessor.h. Referenced by AnalyzeAMDProcessor(), AnalyzeIntelProcessor(), AnalyzeUnknownProcessor(), CProcessor(), CPUInfoToText(), DecodeProcessorConfiguration(), GetCPUInfo(), GetStandardProcessorConfiguration(), GetStandardProcessorExtensions(), and TranslateProcessorConfiguration(). Definition at line 170 of file llprocessor.h. Referenced by AnalyzeAMDProcessor(), AnalyzeIntelProcessor(), AnalyzeUnknownProcessor(), CProcessor(), and LLCPUInfo::LLCPUInfo(). Definition at line 169 of file llprocessor.h. Referenced by CProcessor(), CPUInfoToText(), and GetCPUFrequency().